Washington Nationals starting pitcher Max Scherzer delivers a pitch during the fourth inning against the Colorado Rockies on Saturday in Washington. 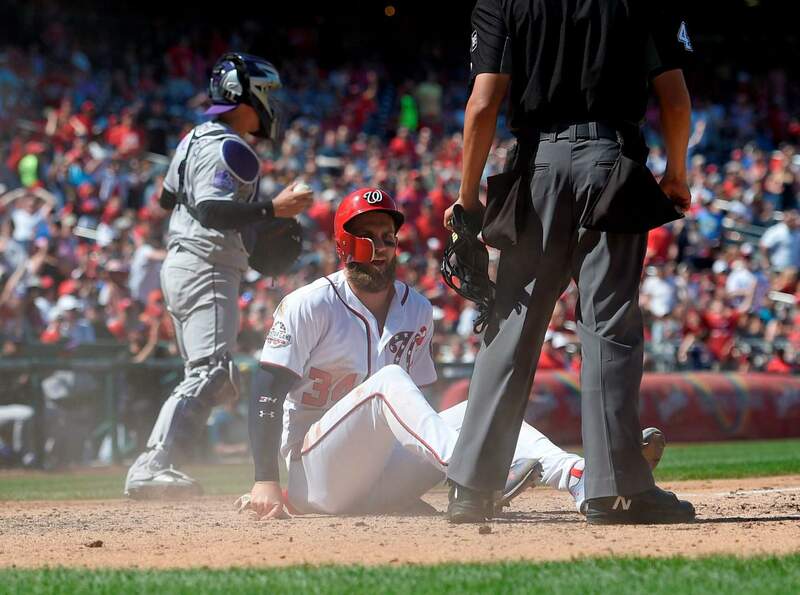 Washington Nationals’ Bryce Harper (34) sits on the dirt after he slid home during the sixth inning against the Colorado Rockies on Saturday in Washington. Colorado Rockies catcher Tony Wolters, is seen at back. Harper was originally called out at the plate but was safe when the call was overturned by replay. 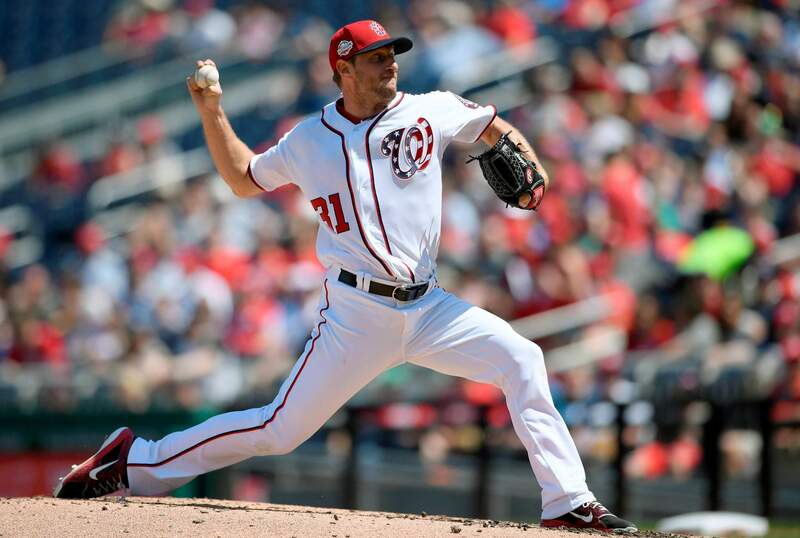 WASHINGTON – Before Saturday’s game at Washington, Colorado manager Bud Black stated the obvious in saying that Nationals pitcher Max Scherzer was one of the three best pitchers in baseball. “Try and keep throwing up zeroes, keep working quick and let the goose eggs keep going and that seems to provide momentum for the offense,” Scherzer said. Washington had scored just one run in each of the first two games of the series and had put up a combined five runs in Scherzer’s previous three starts. None of that worried Scherzer, who trusted the Nationals offense to break through, even if he had to get it on the act a bit. Scherzer got Washington’s third hit of the game and reached second on a throwing error, one inning before the Nationals turned four hits into four runs in the sixth. “I can’t stress how frustrating it is to go out there and cruise, and let it all go to waste,” Gray said. Moises Sierra drove in two runs for Washington in his first big league start since 2014 with the White Sox. He played in place of outfielder Brian Goodwin was a late scratch with a sore left wrist, which has sidelined him since he left in the eighth inning of Wednesday’s 5-3 loss to the Braves. SERVING TIMERockies 3B Nolan Arenado dropped his appeal and began serving a five-game suspension for his part in Wednesday’s brawl with the Padres. Outfielder Gerardo Parra, who is facing a four-game suspension for the same incident, was in the lineup and scored on Blackmon’s home run in the first after drawing a walk. TRAINER’S ROOMNationals: 3B Anthony Rendon (toe) was out of the starting lineup for the first time this season. He left Friday’s game after fouling a ball off his left big toe in the fifth inning. “He’s sore, real sore,” Martinez said. “He’s probably going to be day-to-day. The X-rays are negative so that’s a good sign. He took a pretty big blow to his big toe so we’ll see how he feels.” ... Martinez said Goodwin became sore taking swings in the cage during warmups and will be reevaluated on Sunday. UP NEXTRockies: LHP Tyler Anderson (0-0, 5.65) had a season-high eight strikeouts in his last start against the Padres on April 10.